Martha Rust (NYU) recently organized an inspiring conference on digital tools called “The Past Has Arrived: The Digital Middle Ages and the Renaissance.” The tools discussed usefully supplement books in both teaching and scholarship. Annotation tools like Digital MappaeMundi–now re-branded as DM–allow users to annotate and link images and texts. 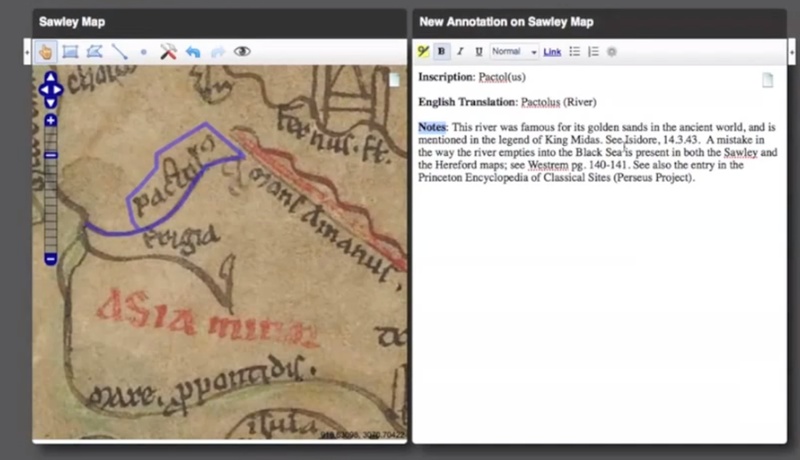 In the image below, downloaded from the DM web site, purple annotation selects material on the twelfth-century world map from Sawley Abbey in Yorkshire (left screen) and links it to text on the right screen. The text can similarly be formatted or annotated to include links to relevant sites, images, or glosses, such as entries in the Dictionary of Old English. Martin Foys and Shannon Bradshaw (Drew) and Asa Mittman (Cal. State, Chico) presented an introduction, a technological context, and an application of this tool. Visualization tools, such as Mapping Gothic France, allow users to view representations of medieval buildings in staggering detail. MGF presents twelfth- or thirteenth-century cathedrals in France “in terms of sameness and difference found in the forms of multiple buildings within a defined period of time and space that corresponds to the emergence of France as a nation state,” according to its web site. The photographs–and there are tens of thousands of them–are strikingly clear and the site is interactive, so that one can navigate the interior of cathedrals as if one were flying through them. Those raised on Harry Potter will be particularly happy with this feature. The views would once have been considered nearly unobtainable. Click on the following screen shot for a larger image. What’s striking about this project is that it supplements book technology. “Architecture doesn’t fit tidily into the pages of a book,” co-administrator Andrew Tallon (Vassar) explains in an interview with Chronogram. Indeed, this five-year project designed by Tallon and Michael Murray (Columbia) demonstrates how digital media can provide features that a book can’t or rarely offers. Using MGF, students can manipulate maps to see the sequence in which Cathedrals were built, zoom in on architectural details, view floor plans, read narratives associated with a building, and even use a simulation tool to experiment with the physics of stone arches. The preponderance of such motion words, once we see them, makes immediate sense in a play featuring fairies and other supernatural creatures that move in ways that humans cannot. One of Docu-scope’s gifts is to help us see formal aspects of a text that we might not otherwise see. In this sense, digital tools can provide access to linguistic features of a text less likely to be found by human reading. Clicking on the text bubble by the author’s name calls up the corresponding EEBO Interactions page, which identifies J.V.C. as a Catholic priest and provides brief biographical information. 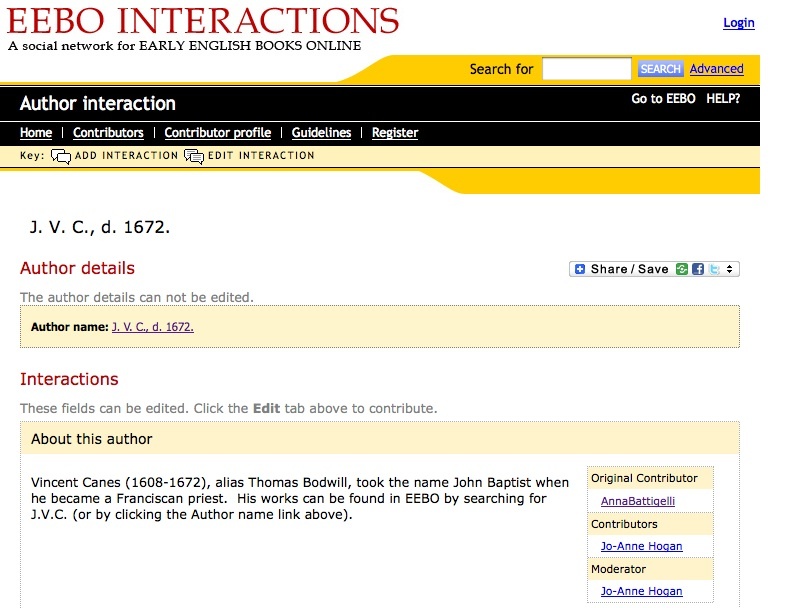 Scrolling down the EEBO Interactions page, one would also find relevant links. Because users can add pertinent information for either the author or the text title, those working on little known work can, if they wish, share their expertise and enhance catalogue entries. This kind of relational cataloguing capitalizes on current technology and points the way to the future. Pedagogical tools were the focus of several talks. These included the Medieval Narrative Project, designed by Evelyn Birge Vitz and Marilyn Lawrence (both at NYU), which collects video clips of performances of medieval texts. Other teaching aids included Second Life, which Martha Driver (Pace) had her students use to construct avatars engaged in medieval contexts. The afterlives of these projects, which continued to be used beyond the end of a given course, suggest that students enjoyed imagining medieval life through this technology. Theoretical and practical issues were also probed. On the practical side, Consuelo Dutschke, Curator of Medieval and Renaissance Manuscripts at Columbia University, argued eloquently for the value of projects like the Digital Scriptorium, which, in addition to collecting images segregated by disparate archives into one database, also allows a “diverse community of medievalists, classicists, musicologists, paleographers, diplomats and art historians” to help strengthen cataloguing. Similarly, Stephen Nichols (Johns Hopkins) and Nadial Altschul (Johns Hopkins), editors of Digital Philology: A Journal of Medieval Cultures, discussed some of the technical and pragmatic issues that emerged regarding digital publication, including the difference between a link to a work of art and its printed reproduction, or how royalties affect what can be included in digital publications. More theoretical speculations included concerns expressed by Alan Galey (University of Toronto) regarding textual variation: how can interface design help organize text, textual notes, and commentary? The Visualizing Variation project demonstrates how digital media provides innovative features, such as animated variants, for textual editing. Nicola Masciandaro mediated on how digital tools produced “textual shapes” other than the article or the monograph. Bill Blake discussed keywords, a topic he broached at the ASECS meeting in April and developed further here. How can searching be conceptualized so as to explore, rather than reproduce an archive? A final keynote delivered by Stephen Nichols on “The Anxiety of Irrelevance: Digital Humanities and Medieval Literary Scholarship” probed the ambivalence prompted by digital humanities projects. He argued that there need not be a disconnect between the goals of Digital Humanities projects and those of traditional humanists, but that more attentive listening and understanding of questions at hand is necessary. The day-long conference and the discussions that it fostered well into the evening, including at a lively dinner, helped advance that needed conversation. This entry was posted on May 5, 2012 at 1:47 pm and is filed under Uncategorized. You can follow any responses to this entry through the RSS 2.0 feed. You can leave a response, or trackback from your own site. Edit this entry. This entry was posted on May 5, 2012 at 8:50 pm and is filed under Annotation Tools, Cataloguing, Digital Archives, Digital Tools, EEBO, EEBO Interactions, Manuscript Culture, Visualization Tools. You can follow any responses to this entry through the RSS 2.0 feed. You can leave a response, or trackback from your own site. Many thanks, Anna, for a very fine, well-illustrated report on what was clearly a conference rich in information and exchange. These remarks articulate effectively some of the issues entailed in constructing the information architecture that we were discussing in the prior EMOB’s post on archives and searching. Equally worth noting are Foys’s remarks about map-based projects using GIS or Google Earth technology and the often corresponding tendency toward impose present-day topography on the past. This presenting the past through the lens of the present is a hesitation I have had with Second Life. There’s something jarring, for instance, in this miniature portrait for sale in Second Life’s marketplace. At the same time, Katherine Ellison’s Island 18 project has a decided appeal as this YouTube piece,The Island 18 Historical & Digital Literacy Project, shows. Ian Gadd has also used Second Life to construct a virtual printing press. I’m sure there are other uses of programs like Second Life or other digital media for teaching and I would be interested in hearing about them. Thanks to all of you who have contributed to this thread. All of this is fascinating, rich, evocative material with which I would like to become more familiar. THATCamp could offer a session on Second Life, Docu-Scope, or any of the visualization tools, including 3D modeling, at ASECS (the sessions are decided by the attendees). There are plans underway to host a THATCamp at ASECS 2013. (So far most survey respondents indicate Wednesday afternoon/early evening was the best time.) There are also THATCamps held regularly across the US and around the world. See the THATCamp website for a list of upcoming ones. Yet, I would also suggest that you explore on your own. For instance you can go to the Second Life site itself and play around with its possibilities. Many of these tools have videos that introduce you to the basics. In addition, I would see who at your university is using any of these tools and see if there is a joint project on which you might collaborate. Similarly, you should also check with your technology and media center to see if they can offer any workshops on a given tool or if there is someone there that can give you individual help. You also might want to approach your college’s interdisciplinary MA and post-bac programs in computer science; professors or their students may well prove to be excellent collaborators in helping you construct projects with these tools. There are also many video tutorials on YouTube for these tools, and a number of blogs, including ProfHacker, are devoted to technology and using various electronic tools and resources. Kirsten, you raise an interesting question with no simple answer, though Eleanor mentions a number of great options. I would appreciate sessions, either at THATcamp or at ASECS, that demonstrate the pedagogical or scholarly utility of new media. The clearer, the better. Especially for those teaching book history or courses dealing with the hand-press era, this tool offers an effective, hands-on learning experience. In “The Second Life of Daniel Defoe: A Review”(Digital Defoe: Studies in Defoe & His Contemporaries. 1.1 : 86-91), Sharon Alker reviews Second Life’s usefulness for eighteenth-century studies. Island 18 and the projects it centralizes features prominently in her discussion. While these projects are extremely well executed, the images at times seem to promote an idealized view of the 18th century. Yet, their artificial quality also accentuates the impossibility of ever really recovering the past as well as the reality that our present always serves as a filter to prior eras. Thanks, Anna, for this terrific “summa” on our conference! In answer to Kirsten’s question, I’d second Eleanor’s recommendation of the Chronicle of Higher Education’s ProfHacker blog (http://chronicle.com/blogs/profhacker/); I follow it on twitter and have learned so much in a one-day-at-a-time kind of way. I’d also recommend subscribing to the blog DHNow (http://digitalhumanitiesnow.org/); their daily e-mail almost always have something of interest, and once again, in a kind of quick-study format that gives a person a person just enough to understand a project or “app” or trend is and to thereby know whether or not she’d like get into it further. I’ll also chime in on Anna’s summary of our event with a recap of a talk by Alan Galey (U of Toronto) entitled “Visualizing Variation in Premodern Books: The Case for Small Projects.” His exemplary “small project” mounted photographs of readers’ annotations gathered from many copies of a given book but all placed on a images from a single copy of the book — to show the commented-upon passages. It’s actually a BIG (as in important, powerful) project but small since it doesn’t entail “server side” coding. Galey’s title also alluded to the Visualizing Variation project (http://individual.utoronto.ca/alangaley/visualizingvariation/) he’s directing, which is “a code library of free, open-source, browser-based visualization prototypes that textual scholars can use in digital editions, online exhibitions, born-digital articles, and other projects.” Galey is also involved with an initiative called Implementing New Knowledge Environments (INKE), a component of which is the Architectures of the Book project on which two of Galey’s grad students, Scott Schofield and Rebecca Niles presented a poster (yes, there was also a poster session!). This project is “an open-access, peer-reviewed collection of richly illustrated essays about specific design features in the history of the book”; a sampling of essays includes one on manicules, one on volvelles, and one on flaps — great stuff! Thanks for specifically mentioning DHNow, Martha; it is an excellent way to become familiarized with much of what is happening on the digital front. Thanks, too, for your remarks on Galey’s “small project.” I’ve been interested in his ArchBook since it first appeared, but I had not been following his Visualizing Variation project. Your description suggests that his talk was based on a sub-project under the Visualizing Variation umbrella, Synoptic Marginalia. 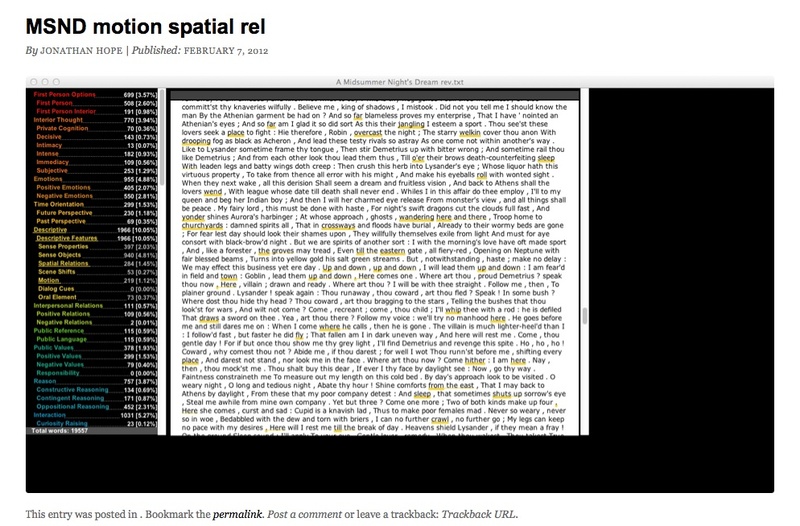 The Visualizing Variation project demonstrates how textual variants can be displayed dynamically. It demonstrates how digital technology might aid textual editing.